Betavit is a high potency Vitamin B1 (thiamine) supplement. Vitamin B1 is an essential nutrient to the body's health supporting energy metabolism, cardiac function & nervous system function. 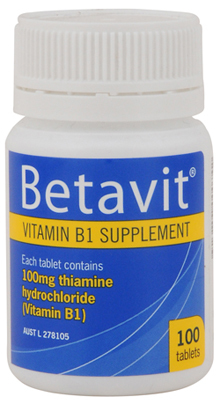 Each tablet of Betavit contains 100mg thiamine hydrochloride (Vitamin B1). Betavit is equivalent to Betamin (Reg TM Sanofi-Aventis Pty Ltd ). Adult Dosage: Take 1 to 2 tablets daily with food or as advised by your healthcare professional. Betavit contains no added sugar, lactose, gluten, salt,yeast, artificial preservatives, colourings, flavourings or sweetners. Store below 30℃. Betavit is available in bottles of 100 tablets.